(Phys.org) —A multi-disciplinary team of international researchers has found evidence to suggest the moon's dynamo persisted until at least 3.6 billion years ago. In their paper published in the Proceedings of the National Academy of Sciences, the team says this pushes back the date for the dynamo approximately 160 million years. 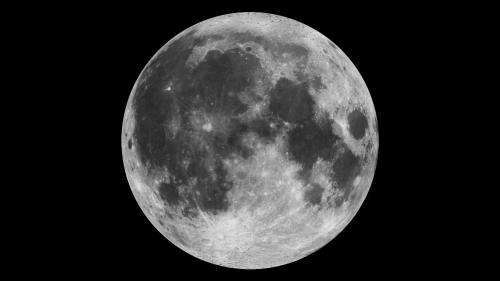 Currently, the moon has no global magnetic field, but analysis of rocks brought back by Apollo astronauts showed that it did at one time. To create such a field, the moon would necessarily have had some churning in its interior—a dynamo. Evidence of a dynamo inside the moon has led scientists to propose different theories as to how it might have come about. Some suggest it might have been due to an impact that knocked the internals loose and set them moving for a period of time. Others theorize it might have been more likely due to differences in heat distribution during radioactive decay, prompting liquid shifting. To gain a better understanding of the moon's dynamo and how it might have occurred, researchers have been working to more clearly define when it came about, how strong it was and how long it lasted. To that end, researchers with this latest effort went back to the moon rocks that started the whole debate. Using newer technology to analyze the rocks, they found that they had, on average, fields of 13–70 microtesla—the higher readings are on a par with that of Earth's magnetic field. More importantly, they found that the rocks showed that a dynamo existed as far back as 3.6 billion years ago. This new finding, the researchers say, shoots down the idea of the dynamo forming due to a large impact. That's because other research has shown that no impacts large enough to cause a dynamo have occurred since approximately 3.72 billion years ago—well before the age of the samples found. But that still doesn't reveal the actual cause. Though they can't prove it, the group suggests the dynamo mostly likely occurred due to interaction with Earth's gravity—likening it to a tug-of-war between the solid mantel and the liquid core, resulting in a constant internal churning. The lifetime of the ancient lunar core dynamo has implications for its power source and the mechanism of field generation. Here, we report analyses of two 3.56-Gy-old mare basalts demonstrating that they were magnetized in a stable and surprisingly intense dynamo magnetic field of at least ∼13 μT. These data extend the known lifetime of the lunar dynamo by ∼160 My and indicate that the field was likely continuously active until well after the final large basin-forming impact. This likely excludes impact-driven changes in rotation rate as the source of the dynamo at this time in lunar history. Rather, our results require a persistent power source like precession of the lunar mantle or a compositional convection dynamo. To create such a field, the moon would necessarily have had some churning in its interior—a dynamo. Or, the Moon may have at one time had a different electric potential than the surrounding plasma in which it was immersed, and as such would create a magnetic field to isolate itself from the surrounding charge. This simple reasoning explains why other small moons, asteroids, and comets have been observed to have or once have a magnetic field. No magic dynamo effects are needed when one considers the basic physics that must be applied to the physical medium which pervades interplanetary space. One of these days astrofizzlicists will figure it out, as soon as they want to phase their occupation out. There is a theory where the first dynamo, with about ~ 100 microT field, was a result of the first mantle diapir that subsequently froze. It is interesting to note that the Moon field was nearly strong enough to threaten the early Earth atmosphere (at the close distance the Moon was orbiting then). One thing is certain, no one of these days will the crackpot figure science out. He doesn't want to figure anything out. He has it figured out, studying something is hard work. So he'll go the easy route, annoy the people who take the time and effort to learn something, maybe that will slow them down and level the playing field. Exactly right, he already knows it all, why spend perfectly good drinking time actually learning about the cosmos? Phhffft, the sites that use pretty pictures and whose authors have good writing skills are far easier to agree with! No need to exercise such skills as logic, critical thinking or mathematics. t is well known that the necessary strong dynamo fields are generated from within, while other astrophysical bodies have weak field generated by the interaction between its ionosphere and the solar wind. I was clear in my post I was refering to smaller non-"dynamo" type bodies, and I agree that the stronger fields require additional input. The energy however is not created by a "dynamo" (put salt water in a blender, there will be no magnetic field) but instead the charged sphere rotating while orbiting within a differently charged medium will create an homopolar motor effect. It is this homopolar motor effect which creates the magnetic field, just as they do in the lab.